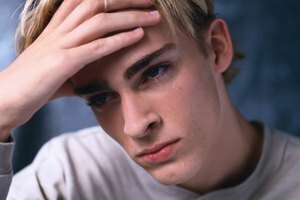 What Can I Do to Help My Boyfriend Be Less Stressed Out? The calmness of the outdoors can help release his anger. Your guy is boiling mad. Whether the reason is trouble at work, a bad grade or problems in your relationship, you can help him calm down. Encourage him to take a chill pill by choosing an effective method that can help him manage his angry feelings. A change of scenery can be what he needs to relax. Let the beauty of nature release his tension. The colors of blue and green in nature can be calming, according to Preston Ni, a professor of communication studies, in his Psychology Today article, "How to Stay Cool Under Pressure." Take a stroll with your guy among the green fields and trees. Sit beside a pond or river and quietly listen to the sounds of nature. The calming atmosphere will help as he considers whatever is troubling him. Deep breathing can have a calming effect on your angry guy. Engage in breathing exercises to reduce his anger. Belly breathing helps someone to fully focus on filling the lungs. It also counteracts the way someone breathes when stressed, according to the FamilyDoctor.org article, "Yoga: Meditation and Breathing." Find a quiet place and have him sit with one hand on his belly. He should inhale through his nose, allowing his belly to expand. Breathe out through the mouth. Continue the breathing exercises until he calms down. Use music as a tried and true method to halt his angry feelings. Music has been around for ages as a way to help soothe and relax, according to the PBS article, "7 Quick Ways to Calm Down," by Therese Borchard, author of "The Pocket Therapist: An Emotional Survival Kit." Classical music can be soothing and help him to calm down. If you are instrumentally skilled, play a few soft ballads for your guy on a piano. Try the sounds of classical composers. Alternatively, have him close his eyes and play a CD with soothing sounds to evoke a calm feeling. Consider soft rock or nature sounds. Let your guy vent. When angry people reveal their frustrations, they are more open to finding solutions and can think clearly, explains psychologist John R. "Jack" Schafer, in his Psychology Today article, "Controlling Angry People." Sit down and allow him to open up to you and be his listening ear. Calmly offer him sound advice on how he can work out a solution to his anger. If his anger is out of control, guide him to professional help that is better suited to help him. Wannikki Taylor is a professional writer with a Bachelors of Arts in journalism from Temple University. She serves as a children's columnist and covers family entertainment for several print and online publications. She specializes in games, crafts and party planning ideas for kids and their families. What Kind of Gift Is Appropriate for a Friend Who Has Lost a Loved One? Taylor, Wannikki. "Ways to Calm a Guy Down When He Is Angry." Synonym, https://classroom.synonym.com/ways-calm-guy-down-angry-17086.html. Accessed 25 April 2019.